The Forum examined how to foster the "next industrial revolution" by harnessing the potential of systems innovation policies that support green growth. The Initial Summary of Discussion Points and the full summary report are now available. The opening speech Beyond COP21: Boosting systems innovation for green growth from the OECD's Secretary-General, Mr. Angel Gurría and invited Key Note speaker Eric Beinhocker set the tone of the Forum. More information on speakers. The scene-setting session looked at the importance of innovation and green growth, with a presentation from the Korean Ambassador to the OECD. Session 1 focused on capturing innovation complementarities for green growth and was held jointly with the OECD’s Working Party on Innovation and Technology Policy (TIP). This session examined options for developing a more systematic approach that breaks down path dependencies and effectively combines the objectives of green growth and innovation policies. Session 2 looked at the implications of green growth in emerging technologies and firm dynamics in order to respond to global challenges such as those associated with addressing climate change, preserving biodiversity, and increasing water scarcity. Session 3 focused on the role of new data sources in greening growth. The new sources of data that are becoming increasingly available can be used to optimize resource use and reduce environmental externalities. Consideration needs to be given to the technical, regulatory and policy implications of these new approaches. Cross-cutting parallel sessions were carried out in three groups, each with a moderator and panel speakers. First Session : "Emerging technologies – risk, trust and social acceptance" There are a growing number of technologies that have the capacity to create more sustainable transport, water, energy and agricultural systems. At the same time, these promising technologies create risks and unknowns for health, environmental safety, and livelihoods. This session examined how governments and other actors might best manage the ethical, regulatory, and social questions surrounding these emerging technologies. Second Session: "International cooperation in research and technologies" Just as the costs of many environmental damages cross borders, the benefits of innovation which mitigate such impacts are also shared. This session looked at the mechanisms and the incentives for international research, cost and knowledge-sharing. Third Session: "Innovation measurement and learning" Assessing the benefits associated with the development and adoption of existing technologies is far from straight forward. Looking forward, the measurement issues become even more difficult. This session discussed how green innovation can be effectively measured. Closing remarks from all the sessions were provided by parallel session moderators in order to highlight key knowledge gaps and identify potential priorities for further work. The Forum's webpage now contains the summary statement, a related news article as well as the Forum's Report. This Issue Paper was led by the Directorate for Science, Technology and Innovation (STI) and coordinated with the Working Party on Innovation and Technology Policy (TIP). This Issue Paper was developped by the Directorate for Science, Technology and Innovation (STI) with linkages to the work by the Green Growth Knowledge Platform’s (GGKP) Research Committee on Technology and Innovation. This issue note was led by the Trade and Agriculture Directorate (TAD). 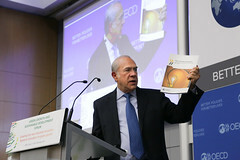 As OECD Secretary-General, since June 2006, he has reinforced the OECD's role as a ‘hub” for global dialogue and debate on economic policy issues while pursuing internal modernisation and reform. Under his leadership, the OECD has expanded its membership to include Chile, Estonia, Israel and Slovenia and opened accession talks with Russia. It has also strengthened its links with other major emerging economies, including Brazil, China, India, Indonesia and South Africa, with a view to possible membership. The OECD is now an active participant in both the G-8 and the G-20 Summit processes. Mr. Gurría has also reinforced the impact of OECD work in several domains, and has steered the launching of high profile initiatives, including several strategies in the domain of Innovation, Green Growth, Gender, Development and Skills. He also launched the "New Approaches to Economic Challenges", an OECD reflection process on the lessons from the crisis with the aim to upgrade OECD’s analytical frameworks and develop a comprehensive agenda for sustainable and inclusive growth. Eric Beinhocker is the Executive Director of the Institute for New Economic Thinking at the Oxford Martin School, University of Oxford. INET Oxford is a research center devoted to applying leading-edge interdisciplinary approaches to economic theory and public policy practice. INET Oxford researchers are working on issues ranging from financial system stability, to innovation and growth, economic inequality, and environmental sustainability. Beinhocker is also a Senior Research Fellow at Oxford’s Blavatnik School of Government, a Supernumerary Fellow of Oriel College, and a Visiting Professor of Economics and Public Policy at Central European University in Budapest. Prior to joining Oxford, Beinhocker had an 18 year career at McKinsey & Company where he was a partner and held leadership roles in McKinsey’s Strategy Practice, its Climate Change and Sustainability Practice, and the McKinsey Global Institute. Beinhocker writes frequently on economic, business, and public policy issues and his work has appeared in the Financial Times, Newsweek, Bloomberg, The Times, Guardian, Harvard Business Review, Democracy, and he is the author The Origin of Wealth: The Radical Remaking of Economics and What it Means for Business and Society. Ambassador Jong-Won Yoon took up his duties as Permanent Representative of Korea to the OECD on 22 October 2015. Mr. Yoon holds a degree in Economics and a Master’s degree in Public Administration from Seoul National University. He also holds a Ph.D. in Economics from the University of California, Los Angeles (UCLA). Mr. Yoon started his career in government in 1984. He served in various offices including the Ministry of Strategy and Finance, the Office of the President, and the Office of Planning and Budget. From 1997 to 2001 and from 2006 to 2009 Mr. Yoon served respectively as Economist and Senior Advisor at the International Monetary Fund. From 2011, he was nominated Secretary to the President on Economic and Financial Affairs. At the Ministry of Strategy and Finance, he served as Director General of the Economic Policy Bureau as well as Chief of Staff to the Minister. His areas of expertise include: implementing and coordinating policies in the areas of macroeconomics, international finance, fiscal and financial sector issues, and structural reforms; drawing up a Medium-Term National Development Strategy and Annual Economic Policy Program; and liaising with the National Assembly and the press on key policy issues. In 2010 Mr Yoon was awarded the Service Merit Medal. From October 2012 until his appointment as Permanent Representative of Korea to the OECD, Mr. Yoon served as Executive Director at the International Monetary Fund. Ms. Kitamori oversees the mainstreaming of green growth in the work of various policy committees of the OECD and in member and other partner countries. This includes a dedicated programme that promotes green growth policies, finance and investment in the Eastern Europe, the Caucasus and Central Asia (EECCA) region. Prior to this, she worked in the OECD Environment Directorate on various issues including tradable permits and taxes, water pricing, climate change, biodiversity, health & environment, among others. She led a flagship project OECD “Environmental Outlook to 2050” published in 2012. During 2005-2006, she served as Advisor to the OECD Secretary-General. Prior to joining the OECD in 2000, Ms Kitamori was at the World Bank where she worked extensively in South and Southeast Asia on urban and environmental infrastructure projects (green finance for urban infrastructure, water supply & sanitation, cleaner production, etc). Jerry Sheehan is Assistant Director for Policy Development at the National Library of Medicine, where he develops and implements policies to foster access to clinical, genomic, and other biomedical data and information. He currently serves as the chairman of the OECD Working Party on Innovation and Technology Policy. He previously worked on science, innovation, and Internet policy at OECD, US National Academies, and the Congressional Office of Technology Assessment. He holds B.S. and M.S. degrees in Electrical Engineering and Technology & Policy from the Massachusetts Institute of Technology. Jan Rotmans is a socially engaged scientist, with more than 200 publications in the field of climate change & global change modelling, sustainable development, and transitions and system innovations. After his PhD-research and work at RIVM he became the youngest professor of the Netherlands in 1997, at the Maastricht University (ICIS: International Centre for Integrative Studies). In September 2004 he founded the new research institute DRIFT, Dutch Research Institute For Transitions, and became full professor in transitions and transition management at the Erasmus University Rotterdam. Apart from his scientific work he also wants to contribute to a better and sustainable society. Therefore a radical change, a transition, is necessary. With his knowledge he would like to make up the rules and transmit them to the people involved in any project, region or sector, so that they can give it a swing into a more sustainable direction. For a more sustainable future in the Netherlands he co-founded the Urgenda in 2007. In 2014 he founded “ Nederland Kantelt “ a foundation that will stimulate transition in the Netherlands on several fields. Zhao Changwen currently serves as the Director General of the Department of Industrial Economy, Development Research Center of the State Council (China). He used to serve in the Enterprises Research Institute of DRC as the Director General and as the Professor and Vice President in Sichuan University since 1995. He was the Fulbright Scholar in University of Michigan in Ann Arbor (2002-2003), Visiting Scholar in University of Oxford (1999), Chinese University of HongKong (2000), and University of Cambridge (2011). His research interests cover industrial policy, financial reform, state owned enterprise reform and the reform of monopoly industry. He has a Ph.D. in Industrial Economics from South-West University of Finance and Economics. Philippe Sajhau is Vice President IBM France in charge of the “Smarter Cities” program (since July 2012). Philippe is particularly involved in projects linked to transport, water management and collaboration between the citizens and their local authority. He is involved in various projects of transformation in several metropolises. He is working on strengthening IBM’s implication in the “FrenchTech” ecosystem. He leads the Town’s Club within the SYNTEC Numerique and speaks in various top schools as the Urban Economics Chair at ESSEC Business School or the e-business class at Supelec but also in events like the “Grand Oral” in Sciences Po Paris or the Unicamp day at the Marne-la-Vallée University. Currently with his professional activity, Philippe Sajhau is also Nogent sur Marne deputy mayor in charge of digital innovation and energy transition. Graduated from Supelec and chairman of the Supelec alumni Digital Club, he has successively been at the head of IBM Public Sector for South-West of France, Telecommunication, Media and Energy sector for France and Belgium, services activities for SME and SMI for France, storage and servers activities for South of Europe and finally the whole SME and SMI Division for France, with a particular attention attached to the development of new business models coming from the emergence of the Cloud. Professor of System Innovation and Sustainability at the Manchester Business School and chairman of the international Sustainability Transitions Research Network (www.transitionsnetwork.org), and one of the world-leading scholars on socio-technical transitions and radical innovation. He has twice won a Research Publication Award from IAMOT (International Association for the Management of Technology), has been selected by Thomson Reuters into their prestigious list of ‘Highly Cited Researchers’, was identified as one The World’s Most Influential Scientific Minds 2014, and has been elected as member of the Academia Europaea (social science section). Erik Fahlbeck is the Chief analyst at the Ministry of Enterprise and Innovation in Sweden. Among other things, he works on growth, enterprise and innovation policy as well as trade and agricultural policy. He and his unit follow research and international experiences in these areas and he is also responsible for the Agency for Growth Policy Analysis. He has a PhD in agricultural economics and has a background also in academia, has been vice chair at the Uppsala Centre for Sustainable Development and on the board for the Swedish Biodiversity Centre. Gregory Nemet is an associate professor at the University of Wisconsin–Madison in the Center for Sustainability and the Global Environment. He is also chair of the Energy Analysis and Policy (EAP) certificate program. He teaches courses in international policy analysis, energy systems analysis, and environmental governance. His research focuses on understanding the process of technological change and the ways in which public policy can affect it. He has been a contributor to the Intergovernmental Panel on Climate Change and the Global Energy Assessment. He received his doctorate in energy and resources from the University of California, Berkeley. His A.B. is in geography and economics from Dartmouth College. Dr. Ir. Marjolein Helder (1983) graduated as a PhD from Wageningen University on a technology to produce electricity from living plants in 2012. Since then she’s devoted her time fully to commercializing the technology that was subject of her research via spin-off company Plant-e. Plant-e currently has 5 employees and two early-stage products on the market to make the world familiar with the possibility to use living plants as an energy source. Plant-e’s vision is to transform wetlands into powerplants without harming nature or altering the view by making use of the natural processes around the plant. Paul Camuti is senior vice president of Innovation and chief technology officer at Ingersoll Rand and a member of the company’s Enterprise Leadership Team. He works with business leadership teams to accelerate global innovation and technology-led growth strategies and promote an innovation-centric mindset for the organization. He co-leads the enterprise strategy organization and oversees the full spectrum of innovation, technology and growth initiatives within the company, including advanced technologies; product, system and solution design; engineering; and product, service and sales commercialization. In addition, he is responsible for cultivating key alliances with external constituents to enrich the advanced technology and innovation capabilities of the business. He leads Ingersoll Rand’s enterprise sustainability work and serves on various boards and advisory councils, including the board of The Alliance to Save Energy, the External Advisory Council for the Department of Energy’s National Renewable Energy Lab, the External Advisory Council for the P.C. Rossin College of Engineering and Applied Science at Lehigh University, and chairs the NREL Energy System Integration Technical Review Panel. In 2011, he joined Ingersoll Rand from Siemens Corporation, where he served most recently as president of Smart Grid Applications for Siemens Energy Inc., focusing on the development and delivery of Smart Grid products, services and solutions across the entire energy conversion chain. Previously, he was president and CEO of Siemens Corporate Research, where he led and served as an avid spokesperson for Information & Automation Technologies. He holds a Bachelor of Science degree in engineering from Lehigh University and completed the Siemens Advanced Management Program at The Fuqua School of Business at Duke University. Nick Johnstone is Head of the Structural Policy Division of the Directorate for Science, Technology and Innovation. In providing support for the work of the Committee on Industry, Innovation and Entrepreneurship (CIIE) and its subsidiary bodies he provides inputs to OECD policy analysis on innovation, firm dynamics, global value chains and productivity. He began his career at the OECD in September 1999, taking up the position of Head of the Empirical Policy Analysis Unit in the Environment Directorate, with responsibility for projects such as the analysis of links between public environmental policy, industrial organisation and technological innovation. He previously held positions as a Research Associate at the International Institute for Environment and Development, and as a Research Officer at the Department of Applied Economics of the University of Cambridge. Dr. Johnstone, a Canadian national, holds a PhD in Economics from the University of Cambridge (UK). He has published widely in the areas of innovation, environmental and energy economics. Florian Egli holds the Mercator Fellowship on International Affairs and is currently working as a climate finance advisor to the Swiss Government. Previously, he has worked as a political consultant for Ecoplan AG and at the OECD and the Centre for International Environmental Studies (CIES) on innovation and environmental economics. He is a global shaper of the World Economic Forum and a board member at foraus – Swiss Forum on Foreign Policy. He holds a Master’s degree in International Economics from the Graduate Institute of International and Development Studies (IHEID) in Geneva. Vincent Champain started his career at the French Treasury as an industrial policy economist. Mid-2007, he was appointed as Deputy Minister for Foresight, Public Policies Evaluation and Digital. He’s now working for the French subsidiary of an industrial multinational corporation. While doing so, he is also the president of the Long Term Observatory, a not-for-profit think tank dedicated to long term issues & strategies. He is the author of several books and is frequently invited to comment long term policies and strategic issues. Lammert Kooistra is an Assistant Professor in the laboratory for Geo-information Science and Remote Sensing of Wageningen University. His interest is in the development of integrated sensing systems, combining satellite, unmanned aircraft systems (UAS) and in situ sensors for monitoring applications in agricultural and natural resource management. The starting point for system development is the user perspective with operational requirements regarding timing, spatial detail and product quality. The flexibility of UAS are an excellent platform for innovative sensing systems. In his research, he is focusing on hyperspectral sensing systems from camera design to data processing into quantitative image products. Professor Hayashida is a member of the faculty of science, Nara women's university (NWU) in Nara, Japan. She received a Bachelor of Science in Geophysics at Kyoto University in 1980 and Ph.D in Science of Atmosphere and Hydrosphere at Nagoya University in 1985. She has experience in atmospheric sciences that include remote sensing and data analysis for atmospheric minor compositions such as ozone and methane. She received Horiuchi Award from Japan Meteorological Society in 2002 for her scientific achievements. She has contributed to the academic community as a member of the Science Steering Group of the SPARC (Stratospheric Processes And their Role in Climate) under the WCRP (World Climate Research Programme) from 2005 through 2008, and now she is a member of iCACGP (international Commission on Atmospheric Chemistry and Global Pollution) which is one of the commissions in the IAMAS (International Association of Meteorology and Atmospheric Sciences) under the ICSU (International Council for Science) family. Her recent work focuses on satellite data analysis related to global warming. She is investigating methane, the second most important greenhouse warming gas in terms of radiative forcing, by using the data observed by GOSAT (Greenhouse gases Observing SATellite) that was launched by JAXA (Japan Aerospace Exploration Agency) and MOE (Ministry of Environment) Japan in 2009. She is now leading a project sponsored by MOE Japan, focusing on methane emissions from Monsoon Asia. Professor Hayashida is acting as head of the education course for Environmental Sciences in NWU. She is also a member of the Expert Committee under the Space Activity Commission, MEXT, Japan as an expert of the earth observation from space. Ich hoon, Choi is the director of the Korea Environment Corporation (Keco), a leading environment management organization of Korea republic headquartered in Incheon, Korea. Mr. Choi was appointed Keco’s Director in 2011. He has been working with Keco for 20 years in a variety of positions in the water sector, including responsibility for Keco’s technical, international and communications programs and served as the organization’s chief technical officer of water supply and sewerage for government policy making and practice on sewage treatment, water reuse, urban drainage and flood control. Recently, he served as a member of Science and Technology Progress Committee at 7th World Water Forum. And he is a member of Environmental Advisory Committee for Pyeong-Chang 2018 winter Olympic and vice president of Korea society of Water & Wastewater. Before joining Keco he worked as a chief engineer of Byuck-san Development Company and Hyundai oil & refinery for 15 years. Luis Munuera is an Energy Technology Policy Analyst with the Sustainable Policy and Technology directorate at the International Energy Agency (IEA), where he leads the smart grids and energy storage technology areas. He is a lead author of the Energy Technology Perspectives series, co-author of the IEA's Energy Storage Roadmap and is spearheading the IEA roadmap for Smart Energy Networks. He holds a PhD in Energy Economics and Technology from Imperial College London, where his research focused on the impacts of decarbonisation strategies on energy networks. He holds an M.Sc. in Energy Policy and Environmental Technology from the same university, and an M.Sc. in Natural Sciences from Universidad Autónoma de Madrid. René von Schomberg is a Science and Technology Studies specialist and philosopher. He holds Ph.D's from the University of Twente (NL) (Science and Technology Studies) and Goethe University in Frankfurt (Philosophy). He has been a European Union Fellow at George Mason University, USA in 2007 and has been with the European Commission since 1998. He is author/co-editor of 14 books. Most recently he has edited the following books: The Future of Research and Innovation (2015), Towards Responsible Research and Innovation in the ICT and Security Technologies Fields (2011), Understanding Public Debate on Nanotechnologies: Options for Framing Public Policy (co-edited with Sarah Davies 2010) and Implementing the Precautionary Principle, Perspectives and Prospects (co-edited with E. Fisher and J. Jones, E.Elgar Publishers, 2006). Jeremy T. OUEDRAOGO is as a scientist in genetics and plant breeding and received his PhD from University Laval (Canada, 2001). He focused his research on the use of biotechnology tools in plant breeding. He has contributed to the creation of many cowpea varieties that are released in Burkina Faso as well as in West African countries. He was elected Member of Burkina Faso parliament from June 2007 to April 2011. At the parliament he contributed to strengthening MP’s awareness in biosciences issues. From April 2011 to November 2014 he was minister of animal resources and fisheries of the government of Burkina Faso. He is now the Head of the Plant Genetics and Biotechnology laboratory in the Environmental and Agricultural Research Institute (INERA) of Burkina Faso. Andy Stirling is Professor of Science and Technology Policy at SPRU (Science Policy Research Unit) at the University of Sussex. Among other projects, he co-directs the Economic and Social Research Council (ESRC) STEPS Centre, Sustainable Lifestyles Research Group and is on the leadership team of the ESRC Nexus Network. Formerly Research Director for SPRU, he has served on advisory bodies for the European Union on Energy Policy, Science in Society, Collaborative Research, Sustainability and Science Governance and the UK government on toxic substances, GM Crops, public engagement and science advice – as well as for the Royal Society, Nuffield Council, UN IHDP, European Environment Agency, Greenpeace International, Global Energy Observatory, Demos and the Green Alliance. He is a member of editorial boards for several academic journals and of the Research Committee of the ESRC. Roland Sommer serves as Managing Director of the Austrian Platform Industry 4.0 since October 2015 and Director of Public-Private Affairs at AVL List GmbH until the beginning of 2016. The mission of the platform is to seize opportunities and innovations to improve production capabilities and the working environment in Austria. In his function as Director of Public-Private Affairs he represents AVL in political assemblies and committees as well as in political decision-making processes regarding research programs and research strategies. AVL is the world's largest independent company for the development of powertrain systems with internal combustion engines as well as instrumentation and test systems. From 2004 -2011, he worked for the Federation of Austrian Industries, where he was responsible for research and innovation policy, both on the national and the EU level. From 2000 to 2004, he was employed by the Austrian Research Promotion Agency respectively its predecessor institution. He studied at the University of Natural Resources and Life Sciences (Austria), Wageningen University (the Netherlands), and the University of London (United Kingdom). He is also active in various national and international bodies. Pranab Baruah is Senior Knowledge Manager at Global Green Growth Institute that supports environmentally sustainable and socially inclusive economic growth in its member countries. Pranab oversees the research agenda of Green Growth Knowledge Platform (GGKP) and contributes to GGGI’s thematic area activities. Prior to GGGI, Pranab contributed to research and project coordination in a number of multi-stakeholder and interdisciplinary research consortia on sustainable energy transition, global environmental change management and low carbon cities at the University of Tokyo, University of Oxford and Institute for Global Environmental Strategies (IGES), Japan. He holds a PhD in engineering (geoinformatics), an MBA in Strategic Carbon Management, and a professional license in green building design and construction (LEED AP BD+C). Marcos Alegre is Executive Director of the National Cleaner Production Center, named Centro de Ecoeficiencia y Responsabilidad Social (CER) administrated by Grupo GEA in Perú. CER has a Green Credit Trust Fund to finance the migration to cleaner technologies in industries in Perú. Also, Marcos is President of the Resource Efficient and Cleaner Production Global Net (RECPnet). UNIDO and UNEP are the Secretariat of the RECPnet that includes members in 60 countries. Currently, Marcos is leading projects on eco-innovation, innovative chemical management and eco industrial parks. Marcos Alegre is Sanitary Engineer from the National University of Engineering (1990, Perú) with a Master of Science in Water and Environmental Management at Loughborough University of Technology (1994, UK). In 2008, he was awarded as trainer on Cleaner Production by UNIDO. Asaf Tzachor is Head of Strategy at the Ministry of Environmental Protection (Israel). He oversees the ministry's strategic endeavors in the realms of urban development, smart cities, innovation, sustainable material management as well as wellbeing, sustainability and resilience measurement. He is a fellow of the Royal Geographical Society UK, a former Business Development Officer in a leading global Clean-tech outfit, and a former Weidenfeld Scholar at Balliol College, Oxford University. In 2014, he was named one the 40 most influential young leaders in government, business, science and the arts in Israel by Forbes magazine, for his work on Israel’s sustainability measures and environmental strategy, for pioneering behavioral economics in the civil service and for promoting public sector innovation. Forbes described him as “one of Israel’s top thinkers on sustainability”. He has written and edited national peer reviewed reports, peer reviewed academic articles, editorials and working papers in the fields of Environmental Policy, Sustainable Development, Economics, Urban Development, Environmental Justice, Innovation and Technology. Teimuraz Murgulia is the First Deputy Minister of Environment and Natural Resources Protection of Georgia. He has held several senior positions within the Georgian government including: Deputy Minister at the Ministry of Regional Development and Infrastructure where he was responsible for sustainable regional development; Director, Sustainable Development Department Centre for Economic Problems Research; Deputy Secretary General for the Parliament of Georgia – Coordinator of Finance, IT and PR sectors; CFO Ministry of Defense of Georgia - Head of Financial Administration Department. His publications include: The Role of Anti-Monopoly Regulation in the Sustainable Development System and Its Importance in Terms of Public Interest (CEPR 2012); Assessment for Sustainable Development in Georgia (CEPR 2011); Sustainable Development System and “Green” Business (CIESR 2011); Role of Economic Security Indicators in Market Regulation (2008). He has a Ph.D. in Finance from the State Institute of Economics and Social Research and a BS in Economics from the Kutaisi State University. Lucas Porsch is a Senior Fellow at Ecologic Institute. As an economist, his work focuses on impact assessments, policy evaluations, and welfare indicators. His main interest is the development of robust indicators of sustainable development and the evaluation of the cost efficiency of environmental policy instruments. He coordinates Ecologic Institute's research on societal welfare indicators. He is currently leading the Network of Green Growth Indicators (NETGREEN), a research project supported by the European Commission's Seventh Framework Programme (FP7), which has developed the tool www.measuring-progress.eu to identify and assess the suitability of green economy and sustainable development indicators. He also leads Ecologic Institute's cost-benefit analysis and impact assessment work. Before his time with Ecologic Institute, he worked as an economic advisor and consultant in the United Kingdom and Germany at the Matrix Knowledge Group, the Department of Health, Europe Economics and the empirica AG. Most of his work concentrated on policy evaluations and impact assessments for the European Commission, British and German public authorities and covered a broad field of policy fields including urban renewal, housing public procurement, health policy, regulation, and social policy. José Pineda is a Senior Consultant working with the Green Economy Advisory Services at the Economics and Trade Branch of Division of Technology, Industry and Economics (DTIE), United Nations Environment Program (UNEP). He was a Senior Researcher for the United Nations Development Programme (UNDP) Human Development Report. He has extensive research experience in the fields of international economics and measurement of development. He was Deputy Director of Research for the Andean Development Bank. He has also served as Chief Economist of the Venezuelan-American Chamber of Commerce and Industry, and as consultant for the Venezuelan Government. He is Adjunct Professor at the Sauder School of Business at University of British Columbia. José holds a PhD in Economics from the University of Maryland. Antoine Dechezleprêtre is an Associate Professorial Research Fellow and Head of the Energy, Technology and Trade research programme at the Grantham Research Institute on Climate Change and the Environment, London School of Economics. His work deals principally with the impact of environmental and climate change policies on businesses, in particular on the development and the international diffusion of clean technologies. His research has been published in international scientific journals in the field of applied microeconomics, environmental economics and energy economics. He has worked as an external consultant for the OECD Environment Directorate, the UK Climate Change Committee, the French Environment Protection Agency (ADEME), ICTSD and the European Patent Office. He holds a PhD in economics from Ecole des Mines de Paris (France). Simon Upton is the Environment Director at the OECD. The Environment Directorate is responsible for Environmental Performance Reviews of Member Countries, the economic analysis of policy instruments used to improve environmental outcomes and a wide range of work related to water, biodiversity, climate and chemicals. He has played a key role in the development of the OECD’s Green Growth Strategy. Mr. Upton is a New Zealander, a Rhodes Scholar and former Member of Parliament. He was Minister for Environment and Science & Technology during the 1990s. He chaired the UN Commission on Sustainable Development in 1999. He has chaired the Round Table on Sustainable Development at the OECD since 1998 and took over his current role as Environment Director in 2010. Mr Upton is a member of the China Council for International Cooperation on Environment & Development (CCICED). Mr. Wyckoff oversees OECD’s work on innovation, business dynamics, science and technology, information and communication technology policy as well as the statistical work associated with each of these areas. He was previously Head of the Information, Computer and Communications Policy (ICCP) division at the OECD which supports the organisation’s work on information society as well as consumer policy issues. Before heading ICCP, he was the head of STI’s Economic Analysis and Statistics Division which develops methodological guidelines, collects statistics and undertakes empirical analysis in support of science, technology and innovation policy analysis. His experience prior to the OECD includes being a program manager of the Information, Telecommunications and Commerce program of the US Congressional Office of Technology Assessment (OTA), an economist at the US National Science Foundation (NSF) and a programmer at The Brookings Institution. Rintaro Tamaki was appointed Deputy Secretary-General on August 1, 2011. His portfolio includes Environment, Inclusive Growth, Fiscal Issues, Development, Green Growth and representing the OECD externally on Financial Issues. Prior to joining the OECD, Mr. Tamaki was Vice-Minister of Finance for International Affairs at the Japanese Ministry of Finance. During his prominent career at the Ministry of Finance, Mr. Tamaki worked on various taxation, budget and development issues. He worked for the OECD Secretariat from 1978 -1980 in the Economic Prospects Division and from 1986 -1988 in the Fiscal Affairs Division of DAFFE. In 1994, he was posted to the World Bank as Alternate Executive Director for Japan and in 2002, as Finance Minister at the Embassy of Japan in Washington DC. He then became Deputy Director-General (2005), Director-General (2007) and Vice-Minister of International Affairs (2009) at the Ministry of Finance. The GG-SD Forum is an OECD initiative aimed at providing a dedicated space for multi-disciplinary dialogue on green growth and sustainable development. It brings together experts from different policy fields and disciplines working in these areas, and provides them with an interactive platform to encourage discussion, facilitate the exchange of knowledge and ease the exploitation of potential synergies. It addresses the horizontal and multi-disciplinary aspects of green growth and sustainable development and so supplements the cross-cutting work in individual government departments and ministries. The Forum operates as an annual event which may take the form of a conference, a workshop or a seminar. Read more on the Green Growth and Sustainable Development Forum.